Media: Soft, glossy, laminated card, colour covers; A4 portrait format on 128 semi-gloss pages (8 in colour). Includes 33 colour artworks and 172 photographs. Advantages: Excellent book on a significant and well-liked aircraft. Usual high standard of text, photographs and the colour profiles. Recommendation: Useful book for both modeller and history-buff alike, with good technical detail and photographic references. After their recent examination of an iconic Hawker aircraft powered by 'blowtorch' (the Hunter), the series returns to consider an equally iconic machine from that stable, but with a 'fan' up front - the Hawker Sea Fury. 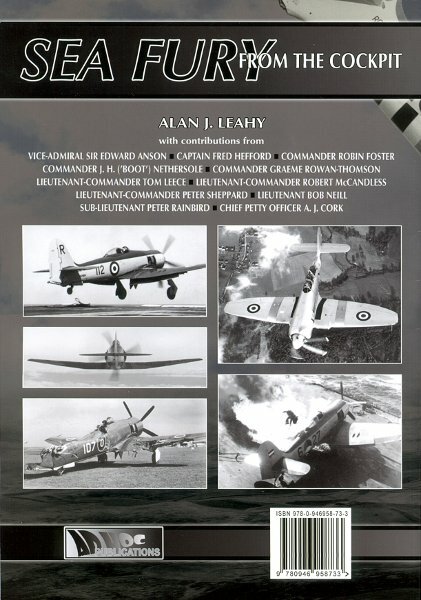 This twelfth volume in the 'From The Cockpit' series, is the second from distinguished naval aviator, Captain Alan J. Leahy CBE DSC, his first being that on the De Havilland Sea Hornet. Following the, by now, familiar style and theme of this series, the book charts the development and operation of the Sea Fury, using first-hand accounts from not only the author, but also from numerous former officers of the Royal Navy (RN) and Royal Naval Volunteer Reserve (RNVR). Copiously illustrated throughout, with the usual compliment of outstanding black and white photographs, the book concludes with the usual colour profiles of Sea Furies from all the main operators. After a brief 'Introduction' and short chapter ('Evolution') on the, by now, well known genesis of the Sea Fury, the rest of the book is broadly divided into four parts. Naturally enough, the main chapter ('From The Cockpit') describes this aircraft from the perspective of several former naval pilots; from take off and landings (ashore and afloat), to tactics, training and the inevitable mishaps. There is no doubt, that the overriding feeling amongst these contributors is that once mastered, the Sea Fury was a delight to fly and was a complete revelation to those who came to it from the rather less refined, Supermarine Seafire. Although trained for combat, post-WW2 era Sea Fury pilots, might reasonably have expected not to gain any actual combat experience during their forthcoming tours of duty. World events however, soon conspired to change all that, particularly in the form of the Korean conflict. This particular campaign is covered in the next major chapter of the book ('Into Action'), a military engagement in which the Fleet Air Arm contributed the major part of the United Kingdom's effort in the air. Here, the book's author, again ably supported by fellow former pilots, describe the intricacies of tactics, targets and the day-to-day experience of flying combat sorties over Korea. This is a fascinating chapter, which brings home the skill and danger involved in such operations, far from home, in difficult terrain, in bad weather and against a determined enemy. Problems in co-operation between allies is also described, with one or two unfortunately leading to incidents of 'friendly fire'. 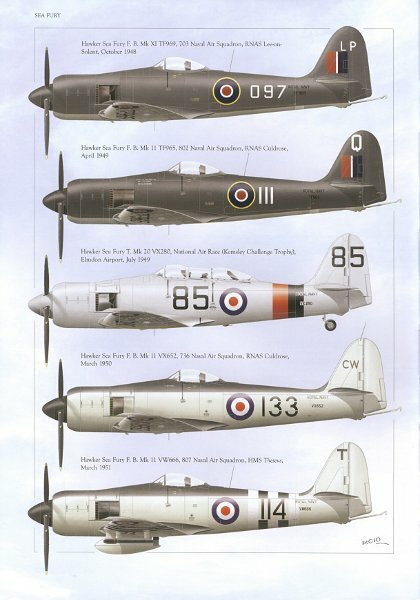 The third major part of the book, covers listings and descriptions of Sea Fury squadrons in three chapters ('Front Line...', 'RNVR...' and 'Second-Line...'). Again, illustrated with many black and white images, these give information on land base(s) and shipboard deployments, commission date(s), Commanding Officers and finally, Senior Pilots (where known). As per usual, the book's final part consists of eight pages of colour artwork profiles by Roger Chesneau, covering Sea Furies of the Royal Navy, Royal Netherlands Naval Air Service ('Kon Marine'), Royal Australian Navy and the Royal Canadian Navy. Amongst these is a four-view of Sea Fury F.B. Mk.11 'WJ295', of 801 Naval Air Squadron, as flown by the author from HMS Glory in December 1952. There is always a danger that, with continued excellence, complacency can set in - well not here. Once again, the 'From the Cockpit' stable has delivered an excellent book on a significant and well-liked aircraft, adding further to our appreciation of naval aviation. Text and photographs are up to their usual high standard and the colour profiles are always a bonus. The description of operations over Korea are especially welcome and as an aside, for those interested in Mediterranean operations, there are several useful photographs of Sea Furies operating from RNAS Hal Far in Malta. 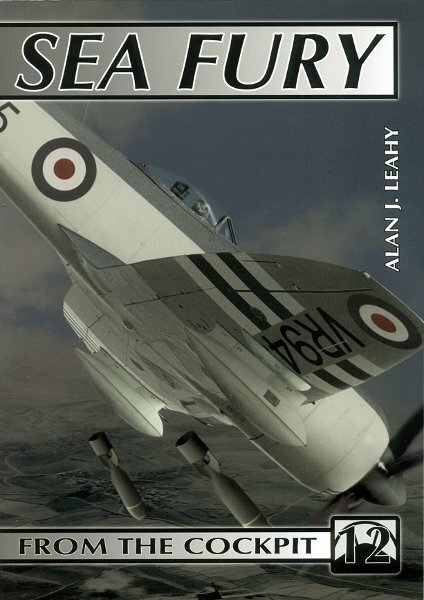 As I mentioned in my review of Alan Leahy's first book (‘Sea Hornet - From the Cockpit No.5’), it is an interesting twist of fate, that if the later designs of RN aircraft carriers had been commissioned sooner, it might have been the Sea Hornet, and not the Sea Fury, which fought in the skies over Korea. The Sea Fury would presumably have become the forgotten post-WW2 fighter, perhaps consigned to second-line duties or sold-off, in which case, the finest single piston-engined fighter aircraft ever built (discuss! ), would never have had the chance to show its worth. So a useful book for both modeller and history-buff alike? Certainly, though I would just add a caveat as regards modellers, following a recent enquiry on Hyperscale. There is plenty of useful stuff here for the modeller, both in terms of technical detail, photographic references and inspiration. What you will not find, is detail of the internals - the 'guts', if you will. No 'walk-arounds', no reproductions from the manuals, no scale drawings nor cockpit diagrams and (ironically), no photographs from inside the cockpit. Equally, the black and white nature of those photographs, means that this book will not help you with colour references either. These may all sound like disadvantages or omissions, but in reality, all those things can be better found from other sources which have a very different remit to this book. For what it is, this book (and the series) delivers 'in spades'. Definitely recommended, for appreciators of the superlative Sea Fury which was, quite literally from Hawker's perspective at least, the 'last piston fighter'.